Thu, Apr 18, 2019, 16:28:36 ---- The fact: 42.844.000 visitors done. The Laser 2000 series diameter measuring devices from Sikora are specifically adapted to the increasing demands of the hose and tube industries, and are developed for product diameters from 0.05 to 300mm. 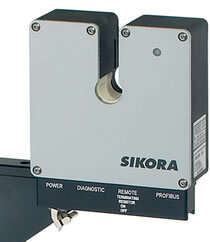 The latest addition to the Sikora family of lasers is the Laser 2003 XY, the smallest of the two-axis-gauge heads. With a repeatability of 0.1m, it is designed for the measurement of extremely small hose and tubes with diameters from 0.05 to 3mm. The device is equipped with pulse-driven laser-light sources in combination with highresolution CCD-sensor lines and powerful signal processors. Extremely short exposure times of 0.2seconds guarantee precision at all line speeds, even if the measuring object is vibrating. The use of the latest SMD technology makes the small and powerful gauge head easy to install anywhere on the production line. There are no optical elements or moving parts in the system to wear or degrade, providing maintenance free operation and optimum reliability.